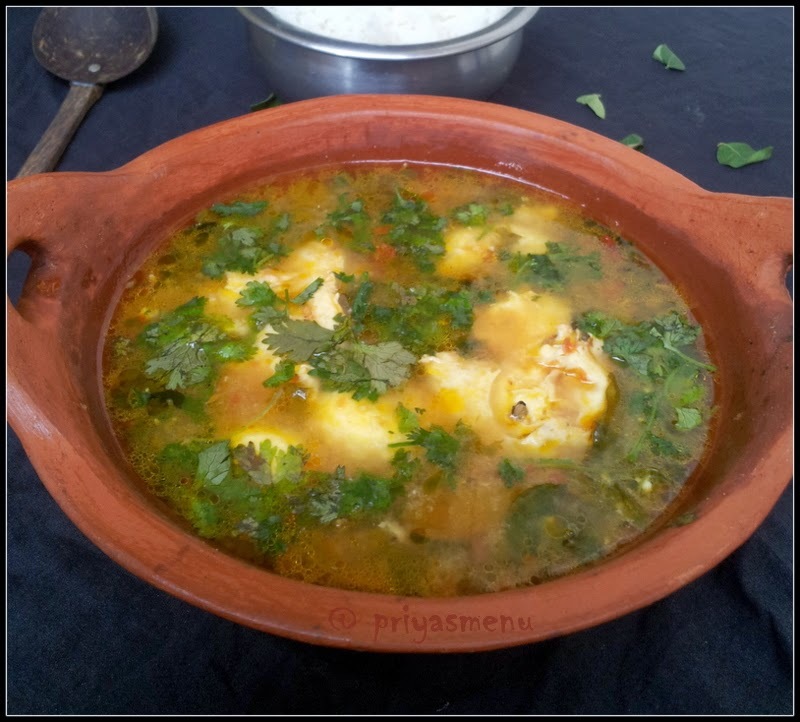 I am sure that Chicken Lovers will never say "No" to this Flavorful Rasam . This is completely my innovation which I tried very long back and got posted in an online magazine “Channel 6 “. Am a big fan of “Peter Kuruvita” a well known srilankan chef and never miss his television shows. I love his style of preparing stock with fresh chillies, curry leaves etc and adding it to the curry. 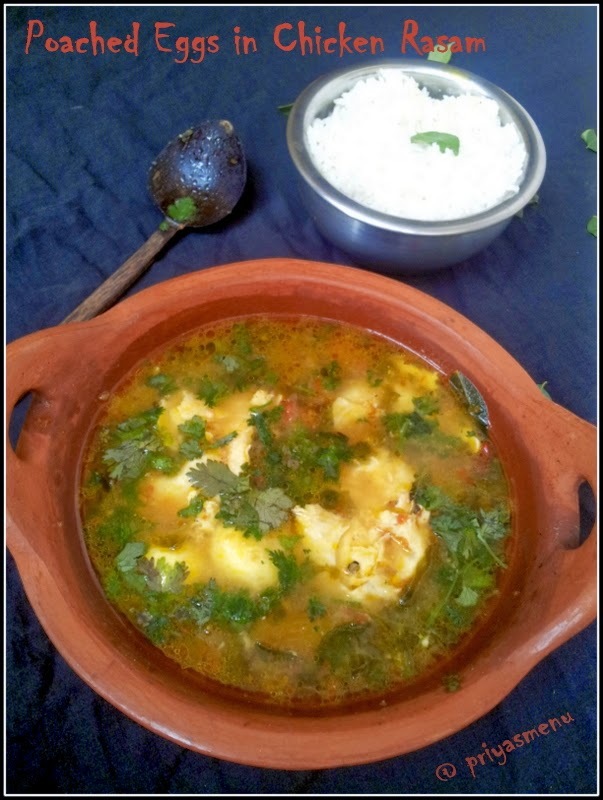 And that inspiration, made me to try this delicious chicken rasam. 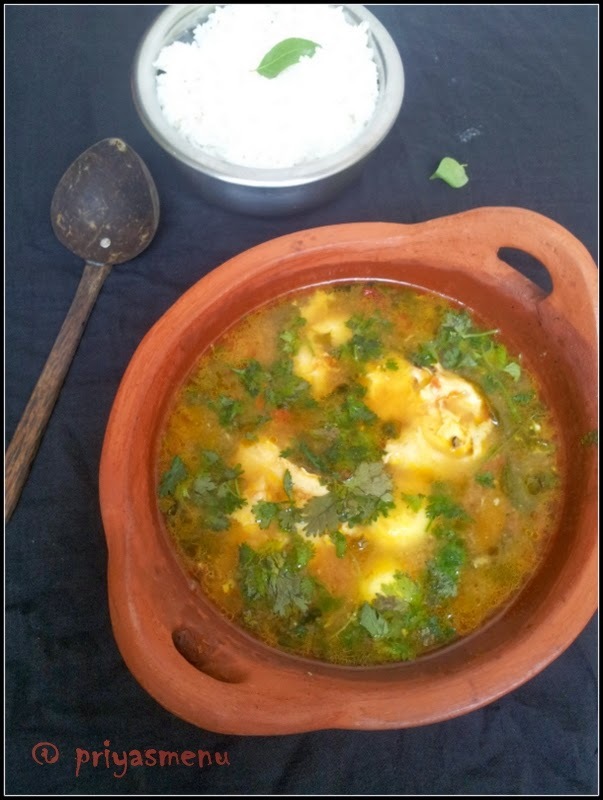 Poaching eggs in a simmering rasam will enhance the taste of rasam and eggs. This can be served with hot Rice and chicken gravy. Try this flavorful Rasam instead of the regular ones and enjoy your meal. Add boned chicken pieces along with garlic pods, curry leaves, green chilli and water in a pan. Remove only the boned chicken and take the flesh part of it. Discard the bones and retain the remaining ingredients along with the stock. Meanwhile, coarsely grind the ingredients given in “For Grinding” list and keep aside. Once it starts spluttering, add hing followed by the dry red chillies. Add the coarsely ground paste and sauté well. Add the tamarind juice and chicken stock along with the removed flesh, garlic, curry leaves and green chilli. Add curry leaves, coriander leaves and salt and cook for 3-4 minutes. Simmer the flame, break the eggs and slowly drop them in the rasam. Once the eggs got poached, switch off the flame and garnish with coriander leaves. So many unique recipes you are posting. ..you are absolutely cooking queen. .. This looks superb. I saw the photo in fb and I was eagerly waiting to see what it is. Weather is bit cold, i would like to have this delicious rasam rite now..drooling here. This is so different than regulars but it looks very tempting ...Lovely ..
love the egg rasam... this looks like a must try!